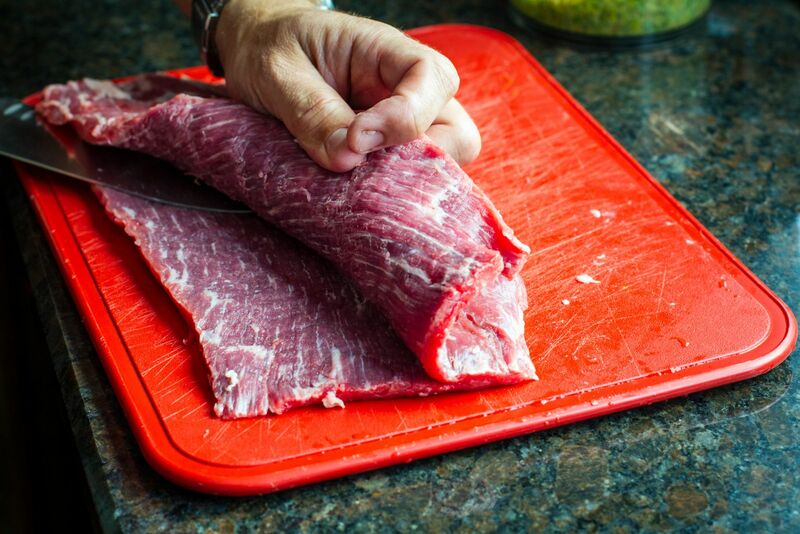 When I grill flank steak, I tend to go one of two ways: I marinade or I stuff. A marinade can add a lot to this cut. Although, I believe the stuffed route is much more interesting. Not only does the stuffing bring more flavor variety than a marinade, it also yields options for texture, which I took advantage of here. When is a steak a roast? When it’s rolled, stuffed, and grilled. This is easily one of my favorite preparations and when there is goat cheese in the mix, you know I’m going back for more. 1. 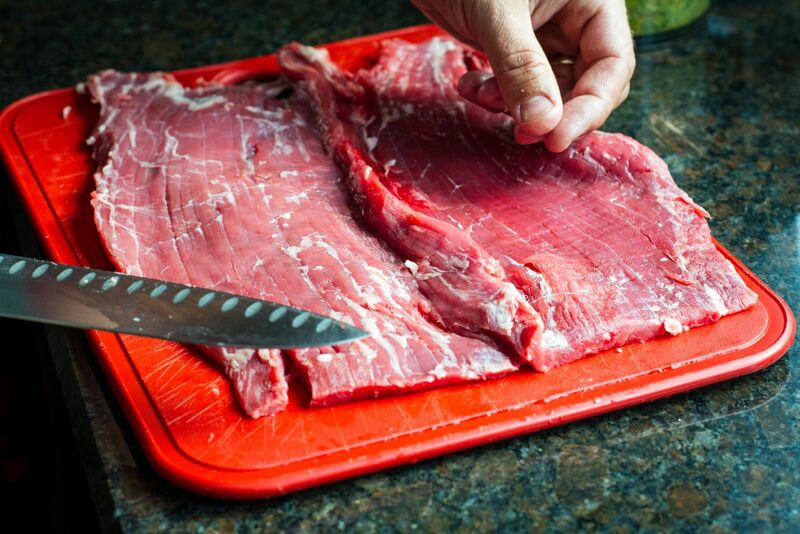 Remove any excessive fat and sinew from the flank steak. 2. Butterfly the flank steak. Note: Flank is relatively thin, which can make this a bit tricky. 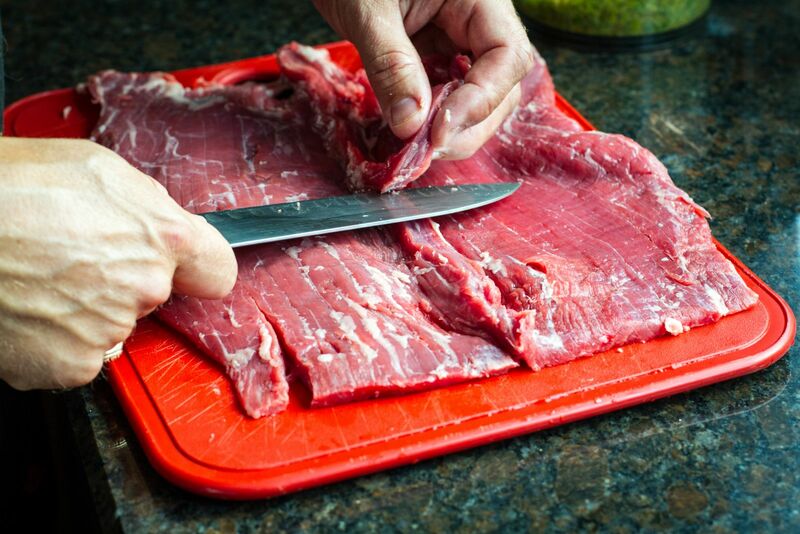 To make the process a little easier, be sure to use a large sharp knife. 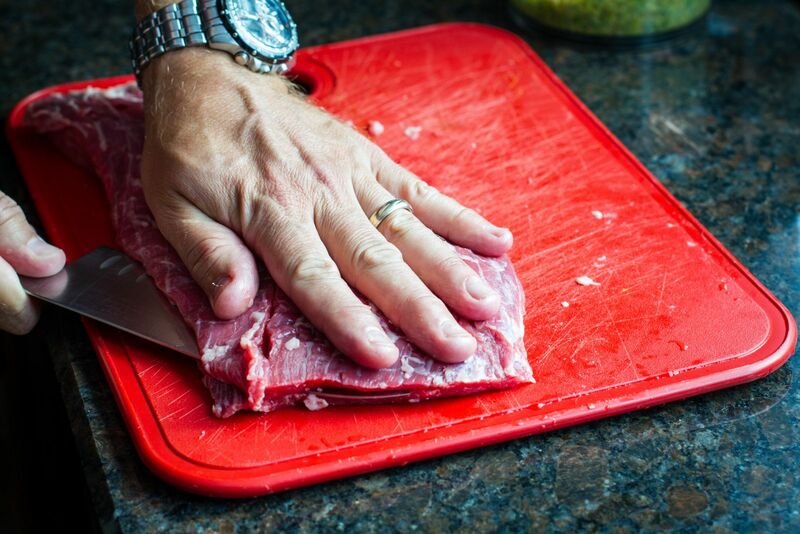 Also, bring the steak close the edge of the counter and cut into the flank so your wrist hangs off the edge. This allows for the blade to remain parallel to the countertop during the cut. I find if cutting directly over the countertop, I dip the blade too much while keeping my hand above the work surface. Starting at one corner, slice into the center of the steak with the grain along the long edge. 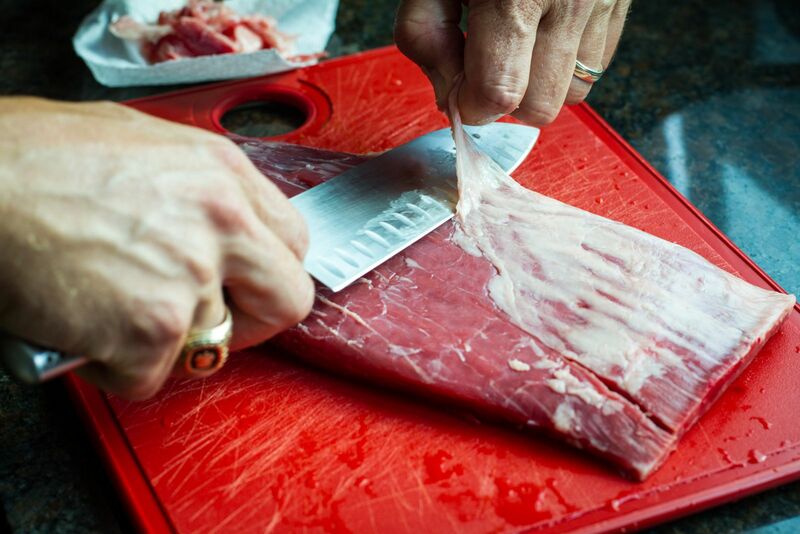 Being careful to keep the knife parallel, continue to cut, stopping approximately 1/2 inch from the other long edge, until the meat can open like a book. 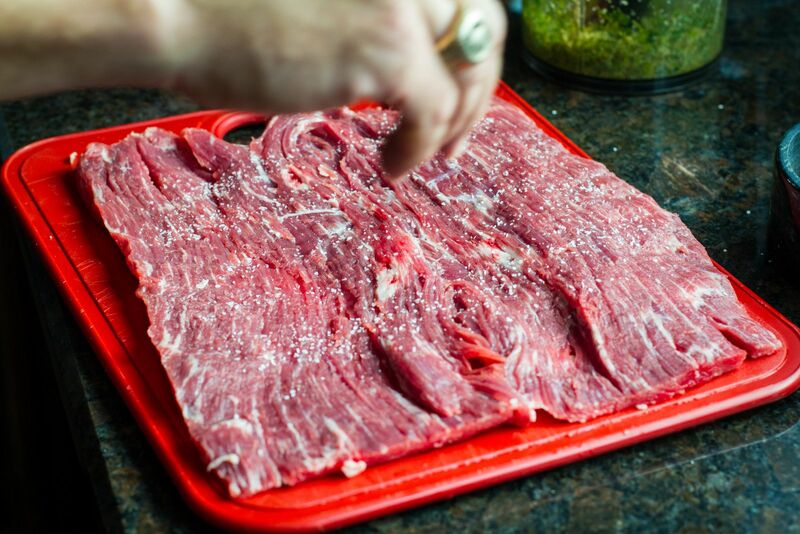 The flank steak should be of uniform thickness. If any meat is remaining at the “hinge,” slice it off. Flip the steak back over so that the grain runs from left to right. 3. Season generously with salt and pepper. 4. 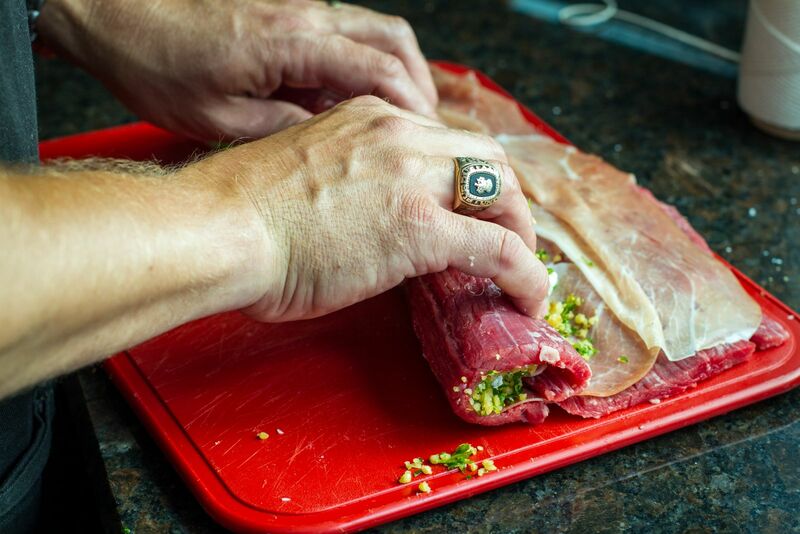 Starting at the edge closest to you, cover the steak with the prosciutto slices. 5. In a small food processor, combine the walnuts, parsley, and garlic. 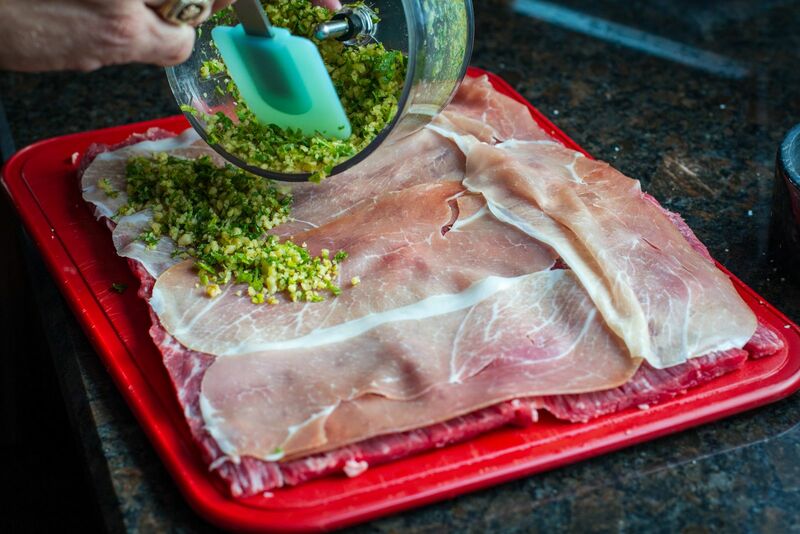 Place the mixture evenly across the prosciutto keeping it off the far long edge by several inches. 6. 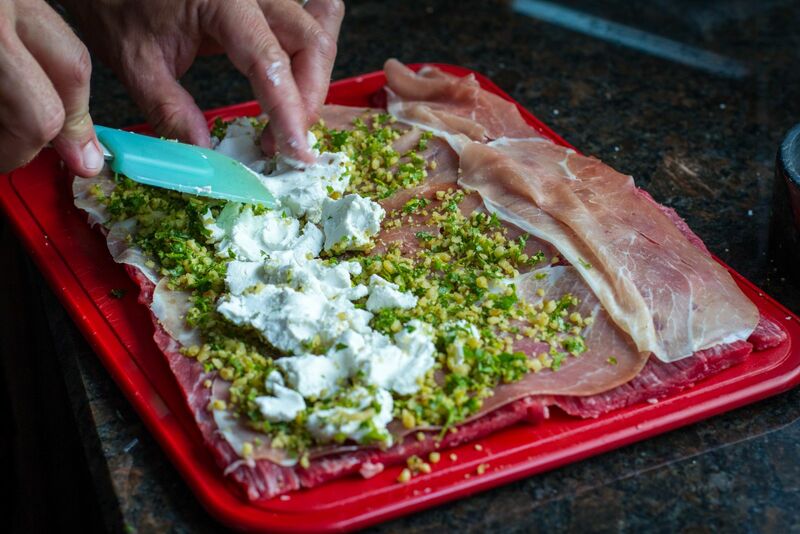 Add the goat cheese in the same way. 7. 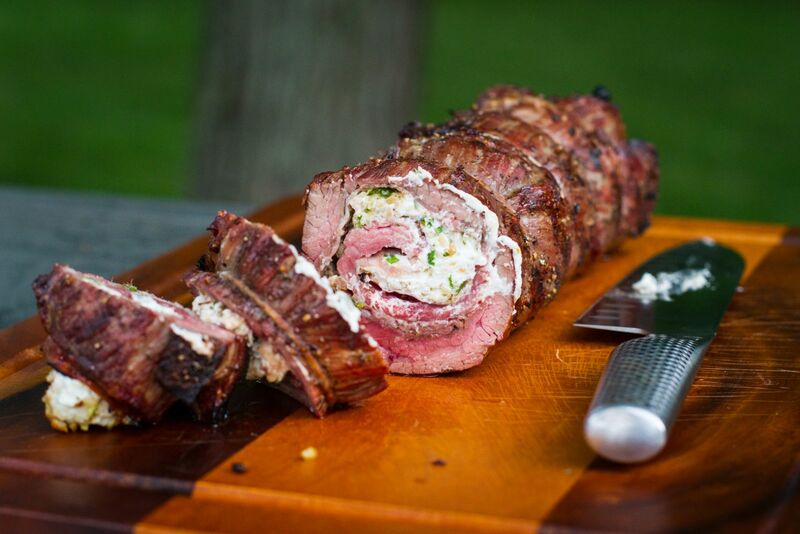 Keeping the meat tight, roll the steak away from you towards the far edge. 8. 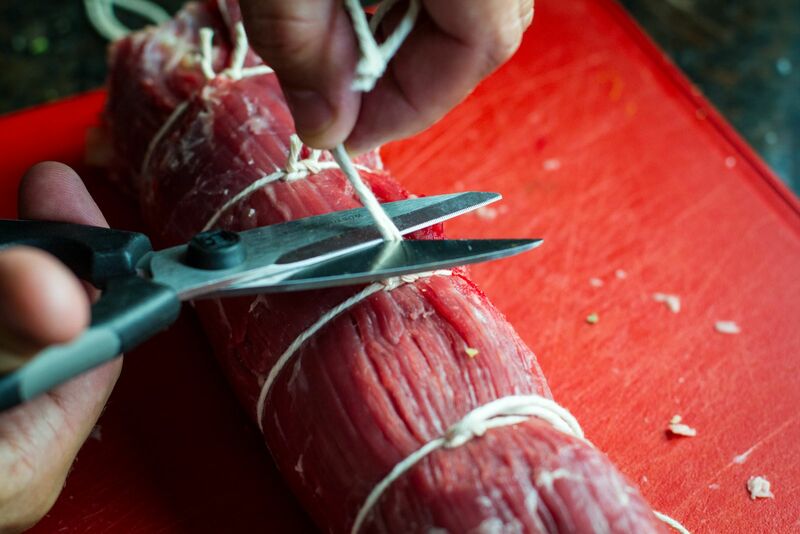 Using butcher twine, secure the flank steak. 9. 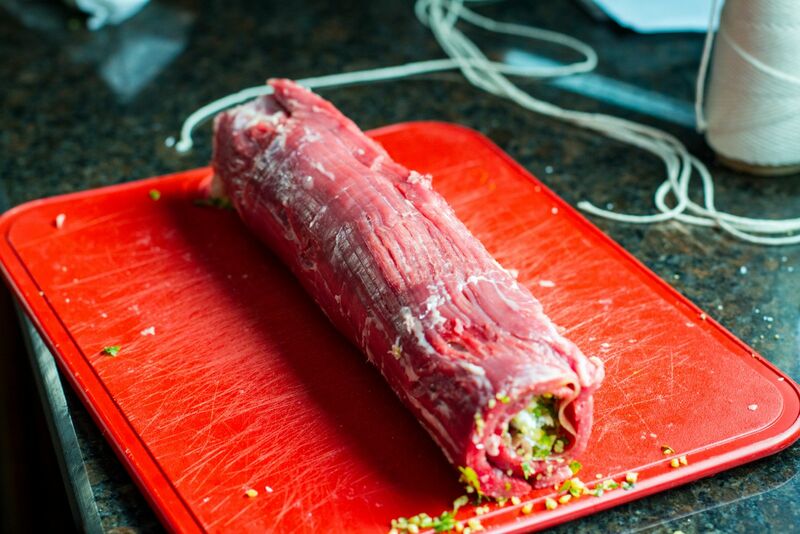 Start in the middle of the steak with the first piece of twine and then work towards the outside. 5 knots should easily hold the steak together. 10. Prepare the grill for a two-zone fire with medium-high heat (400-450 F). 11. Lightly brush the steak with olive oil. 12. Sear each side of the steak over direct heat. Approximately 2 minutes a side, for 8 minutes total. 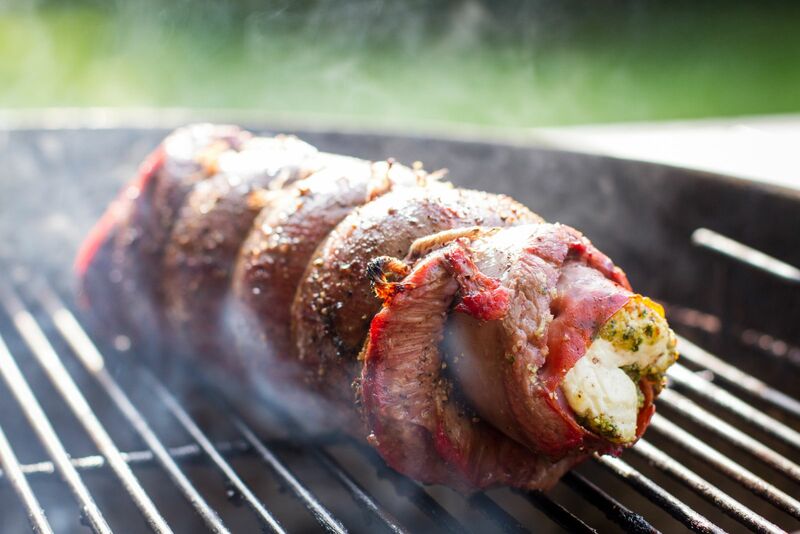 Move the steak to indirect heat and continue to grill for approximately 20 more minutes, or until the internal temperature of the flank steak is 130 F, as measured with an instant-read thermometer. 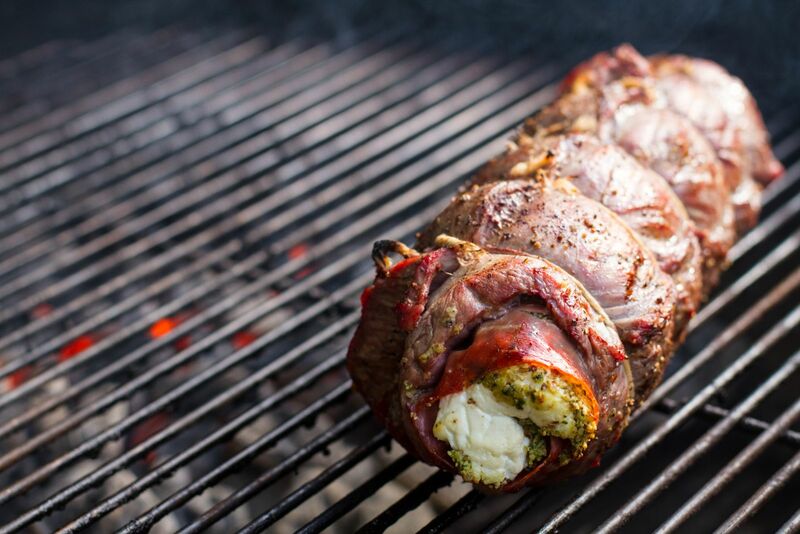 Remove from the grill, tent with foil, and allow to rest for 8-10 minutes. Slice and serve.